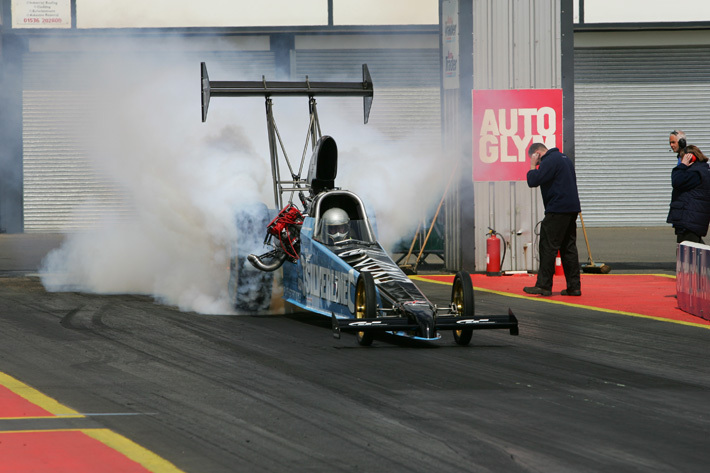 The last progress report I wrote took us up to the Main Event at Santa Pod, the first round of the FIA European Championship. 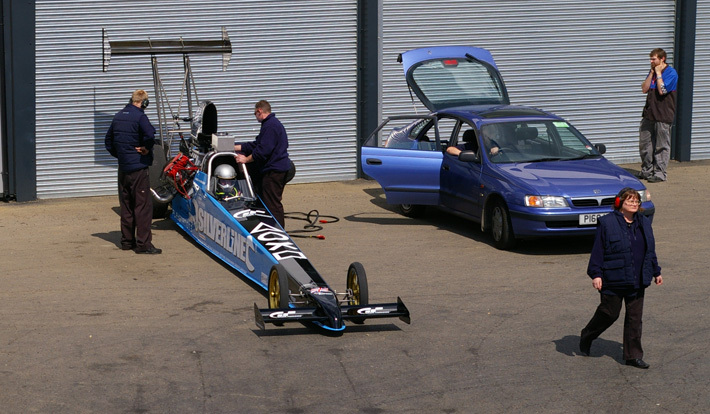 Since then we were able to make a number of alterations to our engine to fix the valve train problems we experienced there. 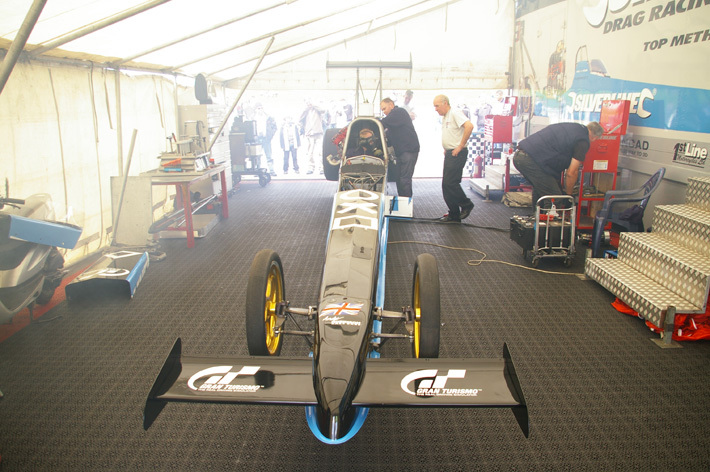 With the next round of the Championship coming up fast in Finland we felt we should do more testing and so we attended the Summer Nationals at Santa Pod, not to race but purely to test and set up fuel and ignition management systems on the car. This was a very successful weekend where we spent all day Saturday checking and resetting systems on the car which involved a total of about 15 warm ups in the one day. On Sunday we felt we had got close enough to a safe setup to try the car on the track, do a burnout and if all was ok attempt a run! So down to the startline we go, fire up the car, roll forward to the startline hit the throttle and nothing!! Hit the throttle again and still nothing (just the engine making a deep growling noise but no revs. Perhaps it was Grumpy)!! That obviously was not right, so back to the pits for a think and a check over of the engine. A quick word with Bill Reichert in the States and he tells me that sometimes these cars do stumble for various reasons but if you hit the throttle and “wait” it should pick up. The engine checks out ok so back to the startline and this time with a little more patience we burn out with no problem, back up to the line and roll into stage for our first attempt at a run, and what a run, at the hit of the throttle its off and flying. A .935/60 ft followed by a 2.51/330 ft are really good numbers, but by then the tyres were starting to smoke then shake and then at half track hard smoke! 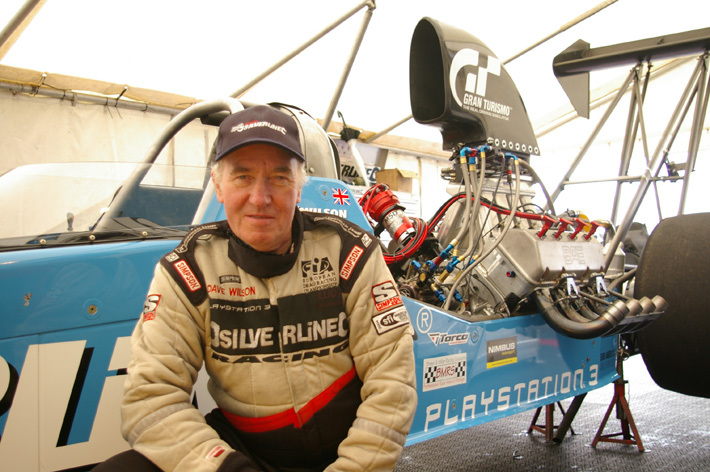 Nothing to do but pedal the throttle and give a quick blast through the finish line, 6.01/229 mph. Not too bad for a first check out. We go back to the pits and check it out and everything looks ok, except we have no data due to the data logger turning itself off in the mid run, probably due to the tyre shake which also broke a number of brackets and fuel system fittings. However at this point we decide that we are close enough to getting this A-fuel combination to work that we will definitely take it to the next championship round in Finland rather than reverting to our blown alcohol setup.